Russell & Kitty here. Hopefully you are enjoying the fall colors. We are, but the falling leaves are another matter! Recently, we enjoyed the Northern California Carnival Convention in Fresno, CA. Normally this time of the year it is “hotter than blazes” in Fresno, but this year the weather was wonderful in the seventies and eighties. We actually wore sweaters to the meetings and auctions! 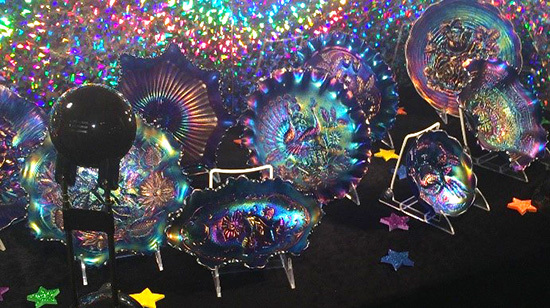 Back in 1969, Joyce and David Middleton went to an American Carnival Glass Convention in Southern California. They enjoyed the convention so much that they decided to see if they could get together the carnival glass people that were listed in the American and International Club roasters in the Bay Area and maybe start a Carnival Glass Club. The first meeting was at their home. Those present loved the idea. Joyce and David had met Don Moore at the convention, but he wasn’t listed in any of the roasters as he was a new collector. Don became President (in absentia); when they got a hold of him, he was very pleased to be the president. The new club decided to meet at different restaurants in the Bay Area with the first in San Jose. We had heard that Gladys Nelson would be at the meeting. She was a collector of stretch glass as well carnival glass. We got together with her before the meeting. Joyce asked us to an Open House that they were having the next month. We did join them as Joyce said the magic words that they also have stretch glass as well as carnival glass. We walked into their home and it was like “heaven” with carnival as well as stretch glass on display. Then we spotted their stretch glass punch bowl with a sterling ladle along with ice in the bowl! Kept hearing “clink, clink, clink” as people helped themselves to punch! So we decided it was our job to very carefully refresh the cups. 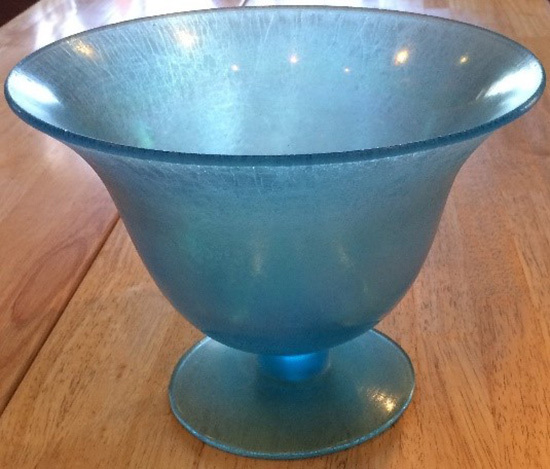 The footed punch bowl is the U.S. Glass #179 bowl in blue which is similar to Fenton’s celeste blue (the blue footed bowl featured at the top). Not many of the footed “punch bowls” or the large bowls are around. They may have met the “punch bowl” fate! 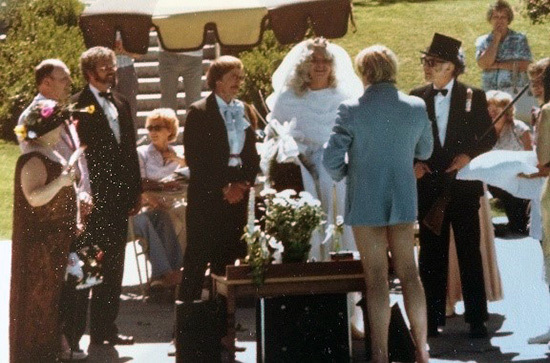 Right to left: Pat R., Russell, U is father of the bride with the shot gun, Marie C., Joyce & David Middleton, can’t remember the next three people, Gordon W. is the bride, John R. groom & John M. ring bearer. Same characters with Tom B. as the preacher. This why Tom B. wasn’t wearing pants! 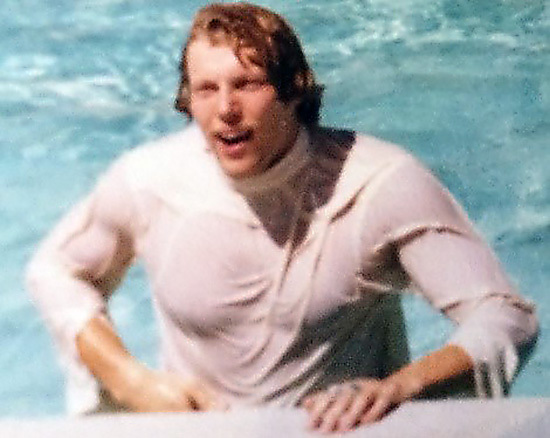 These were taken in 1981 NCCC convention in Fairfield, CA. This was the best wedding for laughs! The rest is history; throughout the years, the NCCC has had members come and go. We have had many notable carnival glass names as members of our club such as Don and Connie Moore, Charlotte and Gordon Williams, Helen and Leland Bell, John Muebauer, Sherman and Timmie Hand, Bill Carroll, John and Pat Resnick, George Thomas, Dale Mathney, Marie McGee, Marie and Jim Capps just to name a few. In the seventies, we started having conventions. All of the carnival glass conventions at that time were having souvenirs made with their names on them, so Timmie Hand designed the complete front of the souvenir plates for NCCC. All of the plates are totally original with only the shape of the plate as stock; even the colors of the plates were original colors! In 2015, NCCC joined with the San Joaquin Club to form one club. Most of the members belonged to both clubs. We had a busy 2017 convention with a pie social as well as a wine and cheese get together. Tom Burn presented an enlighten program on Northwood carnival and stretch glass. 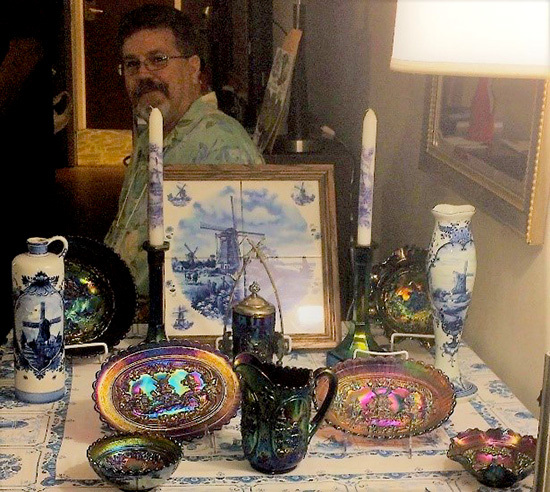 Debra and Tom Burns had a nice auction for us with most of the pieces in the auction having outstanding iridescence. 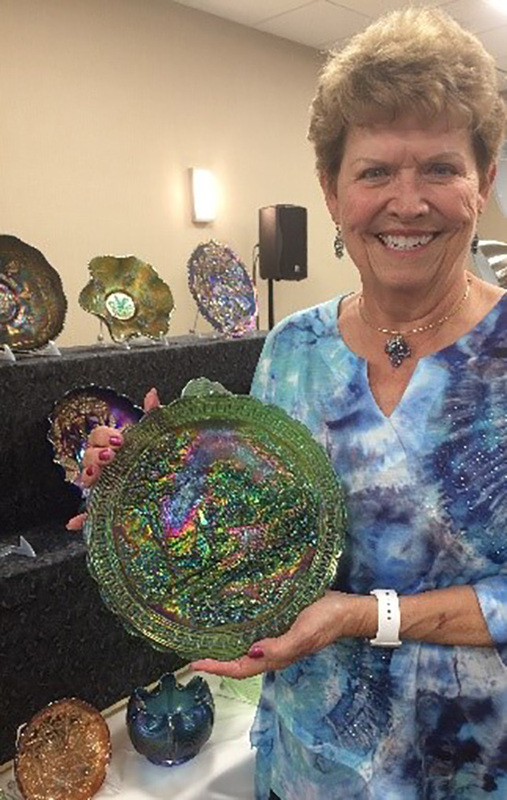 Darlene Grogan presented us with a wonderful program on her “Second Collection of Carnival Glass” after the banquet. There was a lot of stretch glass in displays as well as for sale in the rooms and in the auction. The city of Clovis, CA had a flea market on Sunday which most of us enjoyed before our departures. 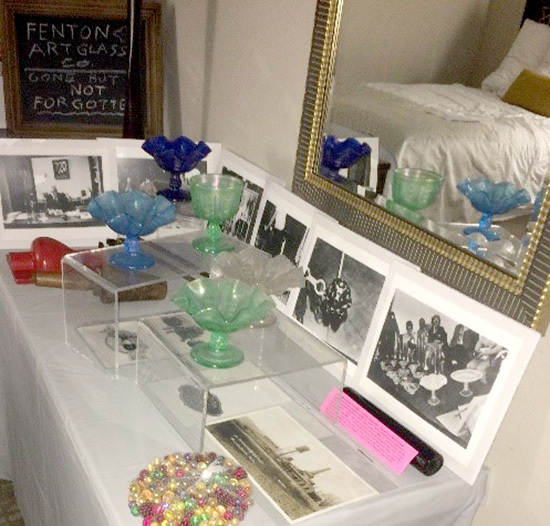 Pictures of the Fenton Art Glass Company when they first produced new stretch glass for the Stretch Glass Society in the 1970’s. The glass is Diamond’s Coin Spot. The marbles we acquired at a field trip to JaBo’s Marble Factory in Reno, Ohio. They do make iridized marbles. Jeff with his Imperial Windmill carnival glass. Even the pickle castor has a Windmill tumbler! Wow, does Bob ever know how to put an outstanding display together! There isn’t any stretch glass in the display, but the carnival glass is out of this world! 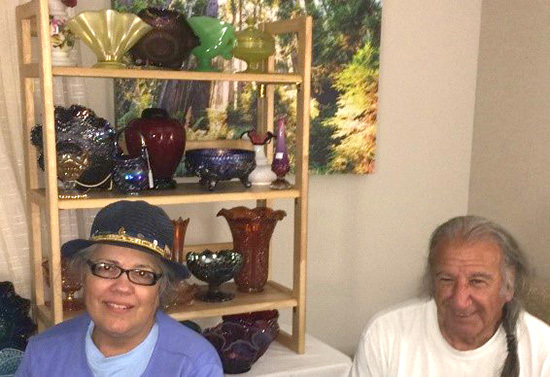 Barbara and Ed relaxing in front of their Fenton glass which includes several nice pieces of stretch glass. 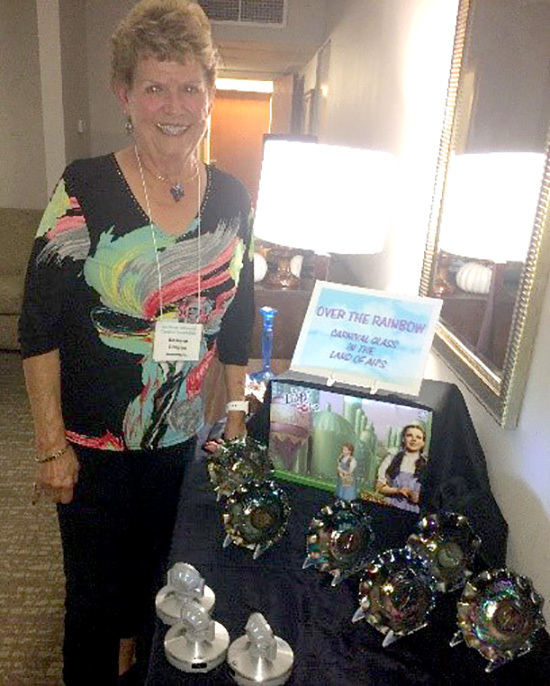 Darlene with her display of Australian small patterned bowls. Gary (the road warrior) brought a wonderful group of carnival and stretch glass for us. 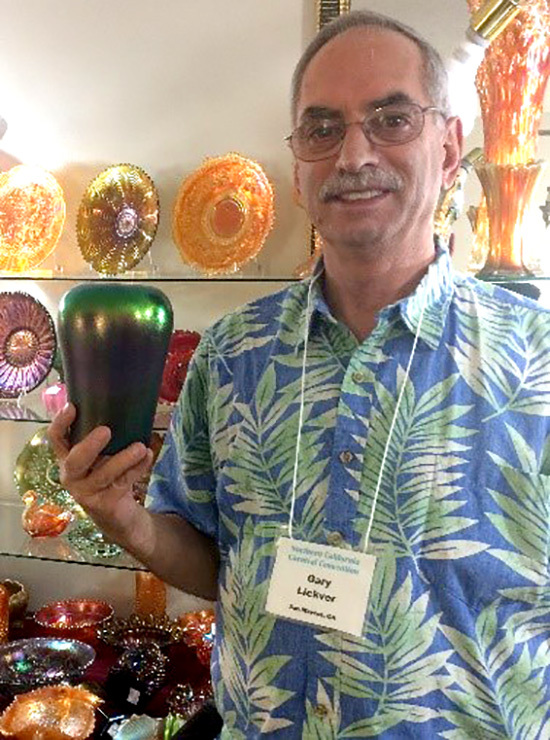 The green Imperial vase that he is holding has outstanding color. Darlene brought this beautiful Imperial NuArt green plate with a stretch finish for her talk. That plate has everything going for it: stretch finish with outstanding iridescence! With the terrible action of one person in Vegas last week, can’t help but reflect about how one person can change so many lives in a matter of a few minutes. We are very lucky to have our beautiful glass which can bring people (of all walks of life) together at carnival and stretch glass meetings and conventions to have fun and appreciate the beauty of our iridescent glass which changes our lives. Please join us in 2018 for the next NCCC Convention!